This super-easy recipe for almond topped fudge brownies is so easy to make, but will look (and more importantly taste!) like you spent hours in the kitchen! These brownies require very few ingredients and are started with a package of fudge brownie mix! So many people think the best desserts are all made from scratch, but we've gathered our favorite recipes that all start with cake or cookie mix and most times you can't even tell/taste the difference. You'll find these brownies rich, fudgy and coconutty. And for even more coconut flavor, try stirring about 1/3 cup of flaked coconut into the mixture with the condensed milk - be sure to not use evaporated milk by mistake. Preheat oven to 350F degrees. Spray an 13x9-inch baking pan with nonstick spray or for easier cleanup, line the pan with foil and spray the foil. Follow directions on brownie package to prepare the brownies. In a medium mixing bowl, whisk together condensed milk and egg. For coconut lovers, add 1/3 cup flaked coconut to this mixture until mixed throughout. Pour mixture of partially baked brownies and spread evenly. 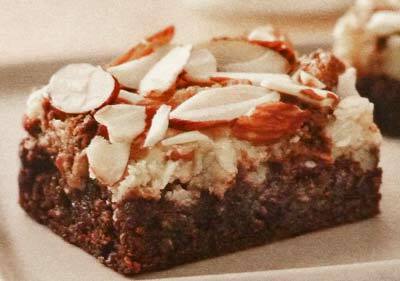 Sprinkle candy bar pieces and sliced almonds over top of brownies. Return pan to oven and bake 22 to 27 minutes or until set. Cool pan completely on wire rack - at least 90 minutes. This recipe makes about 32 Almond Fudge Brownie Bars.